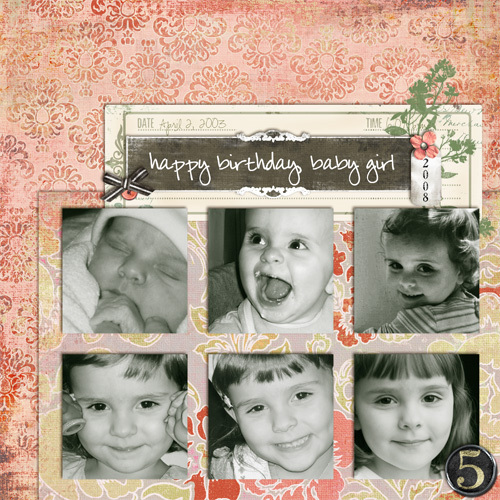 all the little stories» Blog Archive » happy birthday, kate. « weight loss and other side effects. My baby is five. Wow. I am not one of those people who easily cries at movies or at songs. Looking at pictures today is making me want to cry. I cannot believe my baby is five. And I know I’m not alone in feeling this way. Every mother freaks out like this, right? Today: Presents and dinner at home with the family. Thursday: Dinner at our favorite restaurant with our friend, Mr. David (who has a present for Katie that she will love!). Sunday: Birthday Party at the house with Grandmom and Granddad (and her aunts and uncles, too). Cold Stone Creamery is in the works! Thursday: We board a plane for Florida! Sunday: We’re off to the Magic Kingdom! Monday: A party at Grammy’s house! Tuesday: Grandpa is taking us birthday shopping. Saturday: Party with our neighbors to celebrate all our April birthdays! This entry was posted on Wednesday, April 2nd, 2008 at 4:43 pm and is filed under family, just life, katie, scrapbooking. You can follow any responses to this entry through the RSS 2.0 feed. You can leave a response, or trackback from your own site. I knew today was somebody’s birthday. I just couldn’t put my finger on it! Happy Birthday Katie! Happy Birthday, Katie! That is A LOT of celebrations for one little girl. Have GREAT time! Happy Birthday Kate!! Isn’t she so gorgeous? I love that last photo of her, she’s so pretty and grown up looking!! Happy Birthday, Katie! Have a wonderful trip to Disney and fun with your birthday celebrations!